When most people hear the words “workers' compensation,” the careers that come to mind usually have to do with construction or another form of manual labor. While its true that careers that involve moving and/or operating heavy equipment see cases of workers' compensation, these are not the only employees who are eligible for workers' compensation benefits. 1. You Must be an Employee: To claim you were hurt on the job, you must be first an employee of the company. It is important to note that volunteers, freelancers, consultants, and other independent contractor roles are not considered employees. If you believe you are wrongly claimed as an independent contractor instead of an employee, you may be able to take your dispute to court before proceeding with a workers' compensation case. 2. Your Employer Must Have Workers' Compensation Insurance: Luckily, in New York State, every employer is required to have workers' compensation insurance. 3. Your Injury or Illness Must be Work-Related: Finally, the injury or illness you are suffering from must have been a result of something you did on the job. A successful workers' compensation case is one that can clearly link the suffering to an on-the-job requirement. Examples would be exposure to toxic chemicals on a jobsite, falls or injuries from transporting heavy materials at work, and so on. 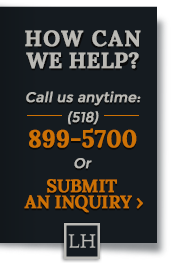 If you were injured on the job, and would like to proceed with a workers' compensation case, an experienced attorney at Lemire Johnson & Higgins can help you. Contact us today.